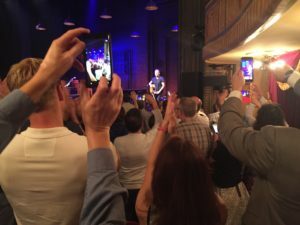 A musician dressed in gray t-shirt, dark jeans, and black boots entered a Broadway stage from the left, walked to the middle and started talking about six feet from the microphone. As he spoke, he eased closer and finally settled front and center standing tall with arms at his side. No guitar, no frills. Just a man on a simple stage ready to take us on a journey. He would not stand still long. Soon he became more animated, hips moving and arms waving at times to support his story. His voice would rise and fall with emphasis. A point was made with words directed to the heart, and another point with words directed to the mind. 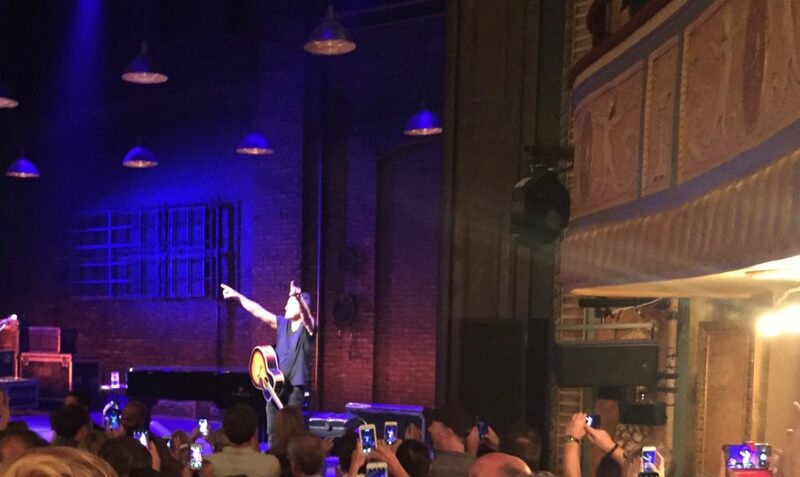 The musician knew how to move people, even stepping in front of the microphone to make a bittersweet point with nothing between him and the audience. Confessions mixed with raw energy. Bare truth. A guitar and harmonica would occasionally appear and be carefully handed off from stage left. Adjustments to the harmonica neck holder came first, right angle, right opening, right size, then the guitar would slip over broad shoulders and a few quick strums would serve cue. Music was ready. Wide stance, shiny boots, pick in right hand, eyes closed and guitar proudly at his waist, a song would begin. The acoustic would speak for itself, and carry all the musical weight — no solos, no base, no horn section, no percussion needed. Songs sounded new, as if they had just been written and were being performed for the first time, just for you. Every song would serve as part of a “chapter” in the overall story. 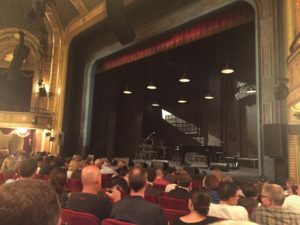 How small is the theater? This photo taken with no zoom, row L at the far right side of the theater. Stories were fun, at times self deprecating, and very heartfelt. The audience, packed tightly in the small Broadway theater became a silent sponge. No yelling, no pictures, some standing ovations that quickly settled down. This was not a concert, it was a life story on display. The autobiographical nature of the show crossed so many paths you knew those seated were being reminded of their own similar experiences, drama connecting souls. A piano sat stage right, as the performer would alternate between center stage and the piano with ease. Seated comfortably, light, simple melodies created a soft foundation for more narrative. Listening closely, emotions would range from pain to laughter, irony, joy, tears, doubt, exhilaration and fatigue. While sitting on the piano bench, we learned the artist’s mother was seven years into Alzheimer’s, like talking to a friend sitting on a park bench. More stories followed by more songs. No mentions about specific shows, groupies or roadies. Even though It was personal, everyone could relate to; mom, dad, family, friendship, life and death. The man and the music were inseparable. It became clear the music was written to cut a path through life’s questions in search of more. More meaning in relationships of family, friends and lovers. More meaning in understanding a sense of place. Where are we from and why are we here? What is real, and what is noise? We all started with a blank sheet and life filled between the lines. Toward the end, one comment stood out regarding the music — perhaps share it with your kids. It was a quick plea to keep the songs alive for the next generation.